Meeting point : All our trips start at Hayarkon 41, Tel Aviv (The Yellow house). Registration : Booking is required – you will receive a confirmation. Contact with MikeyBikey is online, through mail, text msg or whatsapp. Starting time: Daily tours at 9 am and 2:30 pm. Kindly check the tour schedule before you book. I am inviting you to join me on my new adventure! 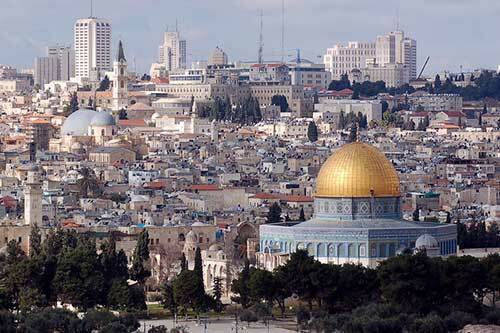 A tour through time going from Tel Aviv, a modern, new city, to the Old city of Jerusalem. This tour is not meant for everyone, only the adventurous among us. It is ideal for small groups of 2-4 people. Do not worry, we are not going to ride to Jerusalem (although it would be possible and it would take us 12 hours and entail going up and down the mountains). We shall take a bus from Tel Aviv to the central bus station in Jerusalem. Upon arrival, we e will start cycling through this magical city. The entire itinerary is open for discussion, and I promise you will certainly get to see the main highlights as the Arab Market, Western Wall, Church of the Holy Sepulcher, Via Dolorosa and much, much, much more….. This guided bike tour is a unique experience and Mikeybikey is the only one in town who does it!! Come along and discover the green lung of the city, with its secrets and gems by the river. 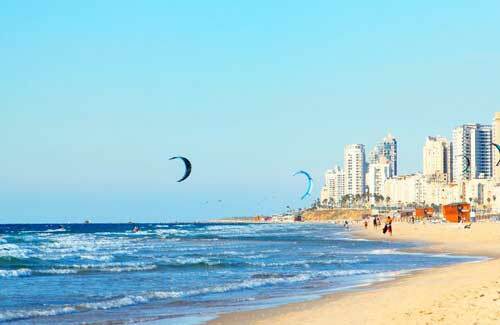 This is where Tel Avivians relax, jog, row and dance…. 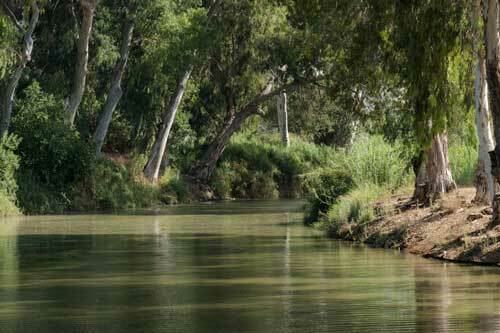 I would even say that Yarkon Park is to Tel Aviv, what Central Park is to New York. From the park you will pedal through Ibn Gvirol Street to Rabin Square, where Tel Aviv’s heart beat is felt. Along green Chen Boulevard we will then cycle to Habima Square – a cultural complex and magic spot to relax, feel the culture of the white city, while listening to music. Carmel market, in Hebrew, Shuk HaCarmel is the coolest of them all. 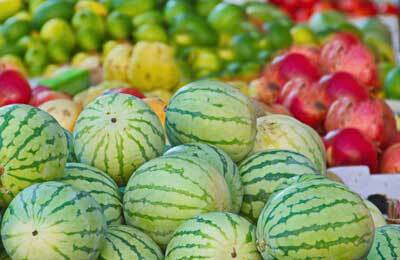 Fruit & Veggies smile at you along trendy cafés, cheese boutiques and chefs’ stalls. If you fancy, you may taste some Bulgarian cheese, at least 8 delicious kinds of olives in different colours and shapes (Oh, how I love olives), salted fish and fresh-pressed fruit or vegetable juice blends (I suggest pomegranate juice). Now time has come for a stopover to taste the most delicious Malabi on earth, just 50 m from Shuk HaCarmel. For starters, Malabi is an exotic Middle Eastern pudding topped with colorful syrup and crushed sweet nuts. On our way to Lewinsky market we will ride through Nahalat Biniamin, a street overflowing with beautiful renovated historical buildings. If you are lucky to ride on a Tuesday or Friday, a Crafts & Arts fair, first of its kind in this country, will be there with all its colours waiting for you to be discovered. Flee market, where Arabic old ceramics meet trendy clothing designer shops. Where Persian carpets pave your way on sidewalks, while you indulge into homemade ice cream. Where you can find a 70 year old telephone, vinyl long plays and old photos of your great-grandparents from Berlin or Bagdad. Unique pieces sold by unique characters who paint Jaffa’s flea market scenery. You can relax and have a cup of coffee sitting in one of the many Vintage cafes that serve Parisian delicacies with exotic aroma while you watch everyone walk by. If you are a dreamy heart who loves mystery (like myself), I invite you for a ride in which you will discover the soul of South Tel Aviv. Here is where diversity masters diversity at its best. Different upbeat neighborhoods with narrow alleys full of contrasts, trendy boutiques, a real maze of history, ethnic patchwork, combined with design stores, delicious ice-cream and French style small cafes. Here Tel Aviv juggles diversity with grace, creativity and art. 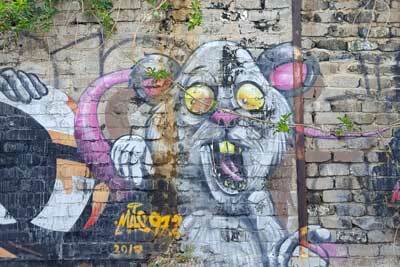 Graffiti transform dilapidated neighborhoods into a huge open art gallery where cosmopolitan rhythm & soul meet. We will pedal off the beaten track paths where lively corners, joie de vivre, hidden churches, American old prefabricated houses split the same space in peace. There is an inner light in South Tel Aviv which is contagious in its best sense. This is an easy bike tour with flat terrain and MikeyBikey can show you everything you need to see and discover about this hidden gem of the city. Here we can stop and observe people and guess their stories. They are unique, unpublished and usually from far away countries. Act now! come and join me on a ride through South Tel Aviv and discover firsthand the message these neighborhoods would like to share with you. If you like beaches (as I do) this tour is tailor made for you. You will discover 14 km (9 miles) of blue sea, white sand, an amazing boardwalk, and much more…. Until 1920 the original plan was to establish factories and storehouses along the coast. It was Bialik, the Israeli national poet, who persuaded Mayor Dizzenghoff to withdraw from this project. Yet, Tel Aviv was built with its back towards the sea. Today Israelis and tourists alike are inspired by this magical coastline and that’s what I am going to be sharing with you. 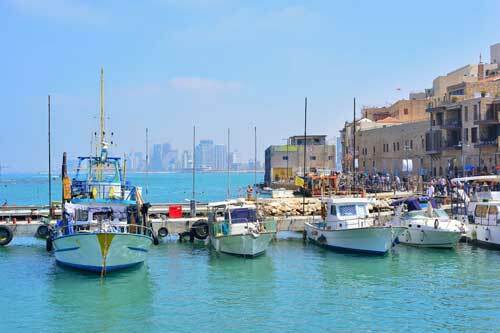 In this well kept corner of the Mediterranean you will witness Tel Aviv as a spontaneous, unexpected stage coming to life. You are part of the play and MikeyBikey gives you the chance to discover the unique rhythm and soul of this city at your own speed. With its irreverent, mischievous and playful setting, a sequence of striking beaches will invite you to dream, ride and discover the incredible blue lane. Pedal along trendy cafés, always keeping your right eye facing the turquoise waters, while the left one is free to discover the best ice-cream boutiques in the Middle East, fashion, high end gastronomy and beautiful people. Riding along the coast you will feel free to enjoy the freedom Tel Aviv generously shares with its people and tourists alike. Freedom is in fact its main Life Motto. And…. if you wish to surf or SUP, MikeyBikey can arrange it for you with an attractive discount.